I know I know, it really seems like I’ve been going out to dinner a lot. But hey, I like to eat. Who doesn’t? 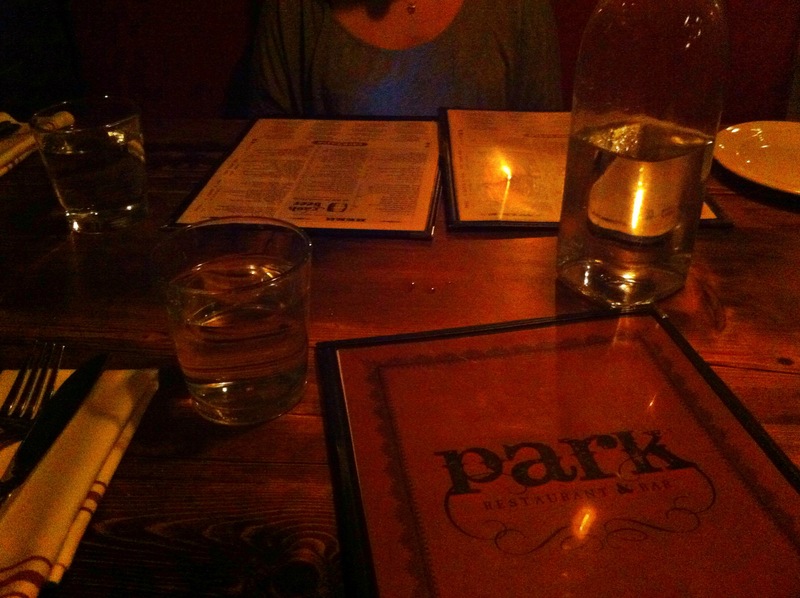 A friend from work asked me to grab dinner with her at a place in Harvard Square called Park. Her boyfriend is the sous chef there so he said he’d send out a couple appetizers on the house (PERK) and also it was Dine Out Boston which is basically Boston’s restaurant week with different featured deals. Park is at 59 JFK Street in Cambridge, MA or just a short walk off of the Harvard Square T stop (red line). It was super easy to get to and it was kind of tucked away in the lower level of a huge building that houses other restaurants and a parking garage. My friend Cathy accurately described it as having a speakeasy feel. 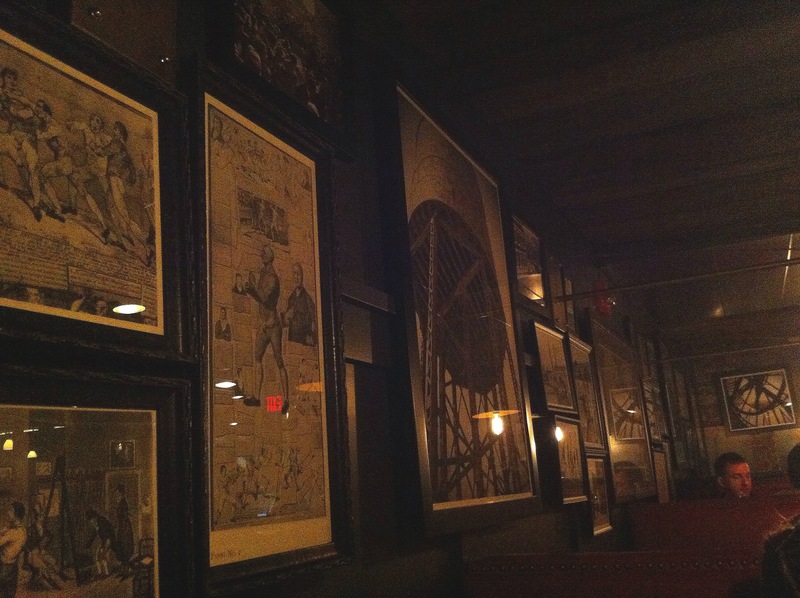 There were a couple different rooms with themed old-timey pictures and articles in each other with a range of different seating options- booths, bar stools, long hightop tables, or even a lounge-y room with high back, comfy chairs. Even though I’m not the biggest fan of dim lighting in a restaurant, I’d give the atmosphere an A++. Park is mostly open for dinner service with the exception of brunch on Saturday and Sunday where they apparently do a decent amount of covers. Before Cathy and I could even figure out what we wanted to drink or whether we were going to order from their Dine Out menu, Corey (Cathy’s boyfriend) brought us out two appetizers: A cheese plate with different jams and the duck confit egg rolls. 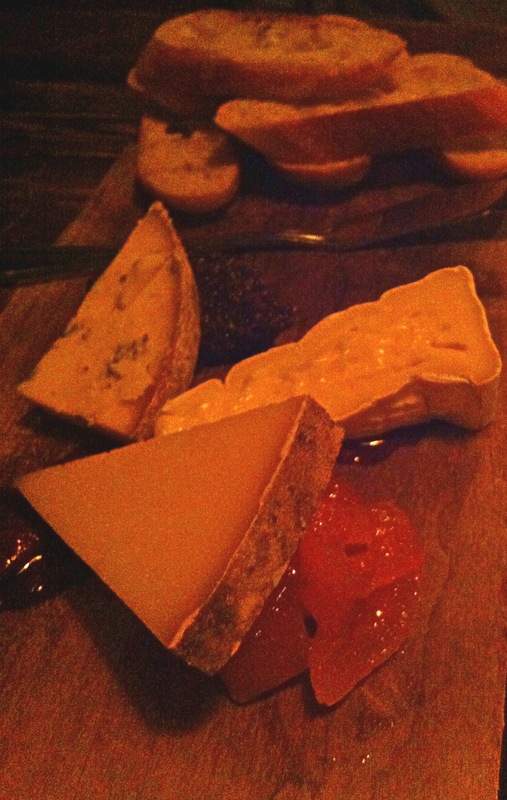 These cheeses came from Vermont; one was similar to a hard white cheddar, another a soft brie and a crumbly blue cheese. They were paired with fig jam (YUM, my fav with the brie), a tri-berry jam, and candied apricot slices. The duck confit egg rolls didn’t even have a chance of me getting a good picture of them because we dug right in. They came with an Asian slaw and a sweet/tangy dipping sauce. The duck was really tender and it complemented well with the crunch egg roll outside. They also brought us out housemade “chips” and another soft cheese that kind of resembled Boursin cheese. So we nibbled on those things, ordered some drinks and then kept perusing the entrees on the menu. I decided to try a fancy drink before going to my regular (a madras or a bay breeze) and went with one called Lavender Moon. It was made with Greylock Gin, St. Germain, Lavender Rose Honey Syrup and lemon juice. I’m really not a fan of gin, I’m usually a rum or vodka girl all the way, but was told that the bartenders make a banging, well-balanced drink so I went for it. It was SO good guys. It was a strong drink, but nothing like a pine tree punching you in the jaw. It was fresh and sweet and flowery from the St. Germain and lavender rose honey syrup. I could’ve drank those all night but they were kind of expensive and lets face it, I’m a broke college kid so I only had one. We finally ordered entrees, and I wasn’t too hungry since I had just eaten my weight in appetizers but basically I just said “hey girl, treat yo self” so YOLO. (Forgive me for just saying YOLO…). I ordered the Butternut Squash Risotto and Cathy got the Braised Pork Shank. 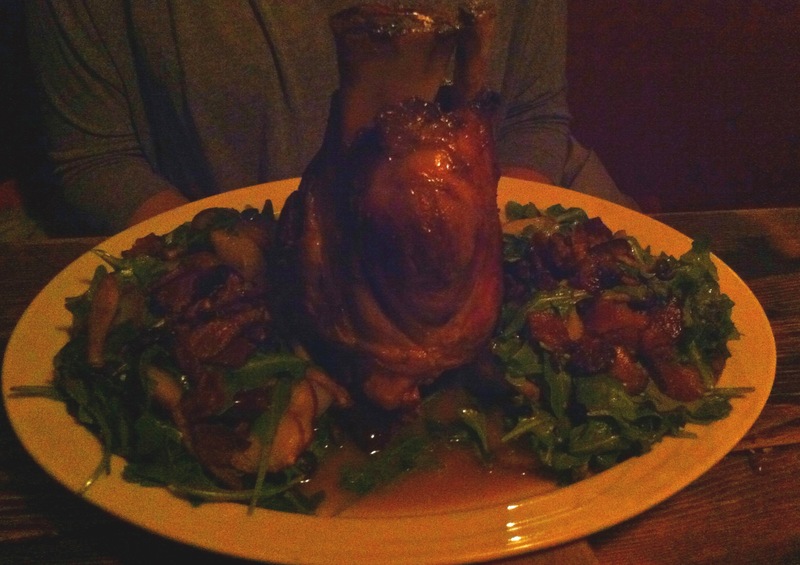 Of course, we shared with each other so I got to try some of the pork shank which was pretty delish! Definitely well cooked and tender on the inside. It came with a olive, bacon, pearl onion and mushroom hash on top of a bed of arugala. 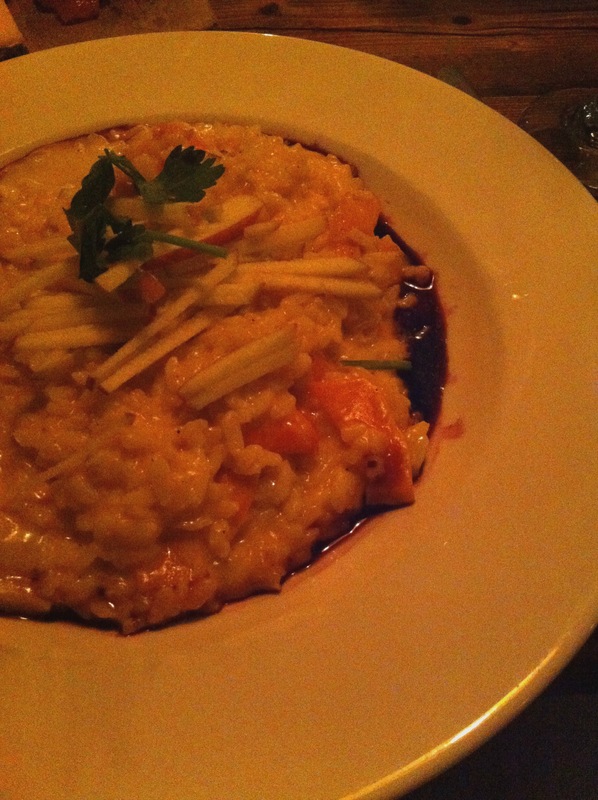 The Butternut Squash Risotto came with local apples, brie and red wine reduction. I ate a lot of cheese that night apparently. The risotto was really creamy with pieces of squash in it adding a touch of savory sweetness to the dish. They julienned apples on top for crunch and the reduction kept the dish in balance with it’s acidity. I definitely couldn’t eat it all but it’ll make for some good leftovers! I was really excited to go out with Cathy because we had always been friends at work but now we were also friends outside of work. We ended up being out for 6 hours between eating our apps and meal, and then having after shift drinks with her boyfriend once he was done. Although the food wasn’t blow my mind incredible, it was well prepared and came out in decent portions. The atmosphere and cocktails were my favorite part of the night but overall, I had a good time with great company! Harvard Square is such a cool place to check out in Boston during day OR night so add it to your places to check out if you ever come to Boston! Check back on Tuesday for a new blog about my post grad life! L8tr.